I stood in line for an hour or so today to get him to sign my copy of Invincible #51 and the first Hush TPB. He was really nice, and tried to figure out what my tee-shirt meant before asking. He also asked if I had any really cool apps on my iPhone yet. (I said yes, but then admitted that I don’t have 2.0 yet because I’m waiting for the jailbreak.) He seemed like a really nice guy. Bonus links: Here’s an interview with Jim Lee by Geeklabel Radio. (This was just the first Jim Lee interview I found. Lee talks about how he got started and answers some lame questions.) Also, here’s a photo of Jim Lee with Mark Hamill last week at SDCC. It will be a ticketed event that does not require a ticket! Let us explain. All current Source & Uncle Sven’s comic book subscribers have already been given numbered VIP tickets. Numbered tickets will go first in numerical order and when they are finished, the general public will have access. Jim will be signing from 1PM to 4PM. Door open at 10AM. Jim will be signing a maximum of two items per person. The reason for this is we want to give as many people as possible a chance. 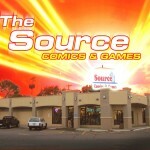 There will be other Super Star Comic Book Artists in the house as well. They will be announced one week before the event. Special storewide sale beginning at 10AM going until Jim hits the trail! 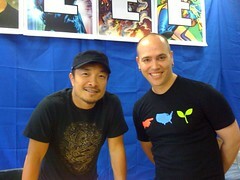 An ocean of cool Jim Lee comic book stuff will be available! We will be collecting donations on behalf of the Comic Book Legal Defense Fund. Just FYI, I have not seen an email with a list of the other creators who will be there. Also, for those of you who are inclined to video games, Jim Lee is the Executive Creative Director of the new DC Universe Online game. Here is a video of Jim Lee introducing the “first look” at that new MMORPG.